Thanks to the systematic recording of baptisms, marriages and burials by the Catholic church, Quebec genealogists – novices and professionals alike – have access to a detailed outlook of their ancestors’ lives and family connections. Through these documents, researching your ancestry in Quebec is much easier than it is in other parts of the world. But how far back can you retrace your ancestors in Quebec? In 1608, Samuel de Champlain establishes the city of Quebec along the shores of the St-Lawrence river. 8 years will pass until the city’s first vital events (baptisms, marriages and burials) start being recorded. Nowadays, the oldest surviving records are from the City of Quebec for the year 1621. Beginning of Quebec city’s register for the year 1621, sourced from the Drouin Collection Records available on GenealogyQuebec.com. The first 20 years were reconstructed from memory shortly after being lost to a fire in 1640. This register, as well as those from every Quebec parish between the years 1621 and 1940, is available in the Drouin Collection Records with a subscription to GenealogyQuebec.com. In a previous article, we explored the lasting impact that first immigrants had in the frequency and variation of last names in Quebec. In this context, the “first immigrant” expression refers to the first member of a given family who settled in a region. When trying to research your ancestry in Quebec, your goal is to establish a direct link between generations spanning from yourself to the first immigrant in your family line. 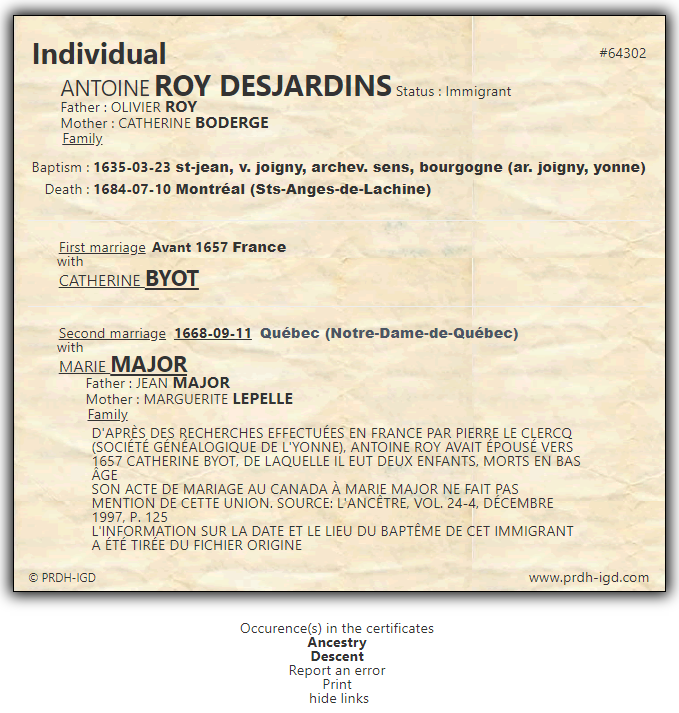 This guide, which describes the process of establishing your ancestry using GenealogyQuebec.com, is a must read for anyone interested in researching their ancestors in the province. When it comes to women, many of these first immigrants are known as “King’s Daughters” (Filles du Roi). The King’s Daughters were single women recruited by the King between 1663 and 1673 in order to populate New France. You will find more information about these fascinating women in this article. To go back further than the Quebec parish records, the best resource available is the “Fichier Origine“. The “Fichier Origine” is a free-access directory of civil and notarized records pertaining to the family origins of immigrants – mostly French – established in Quebec between the early 1600s and 1865. It contains every individual whose birth or baptism record was traced back to their country of origin. As such, you can use the Fichier Origine to find information predating the arrival of your ancestors in the province. In addition, you should know that the PRDH-IGD individual files often integrate information sourced from the Fichier Origine. 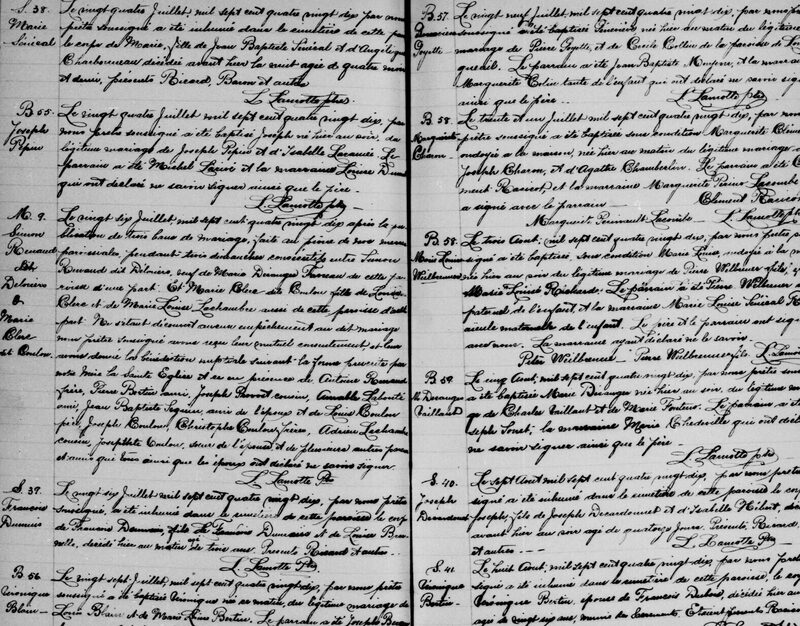 For example, here is Antoine Roy dit Desjardins’ individual file, where the date and location of his baptism were taken from the Fichier Origine. To conclude, it cannot be overstated how lucky we are in Quebec to have access to such a wealth of historical documentation and information, which makes it possible to research our ancestry all the way back to the early 17th century. This is particularly evident if your genealogical research takes you to another region or country, where the information is unlikely to be as accessible and detailed. Previous PostPrevious Postcards Update And Tens of Thousands of New Documents on Genealogy Quebec! 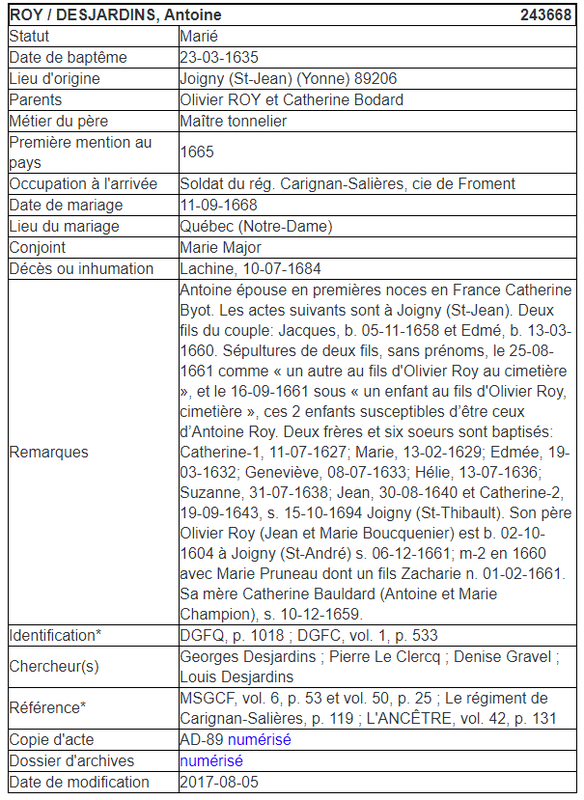 Next PostNext LAFRANCE Update And Addition of 30 000 Newspaper Obituaries on Genealogy Quebec!